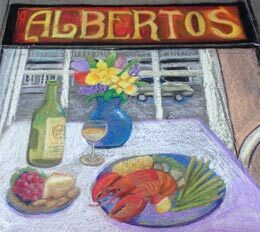 For 30 years Alberto's Ristorante has had a well deserved reputation for its Northern Italian cuisine and homemade pasta. The lounge is a great setting for a before dinner cocktail, special martini or after dinner expresso. Jazz is featured on Friday nights. Intimate fireside dining rooms provide a casually elegant experience; and our outside seating is especially inviting in-season. Highly Recommended by the Cape Cod Times, New York Times, Boston Globe, Cape Cod Life, Cape Cod View and AAA.